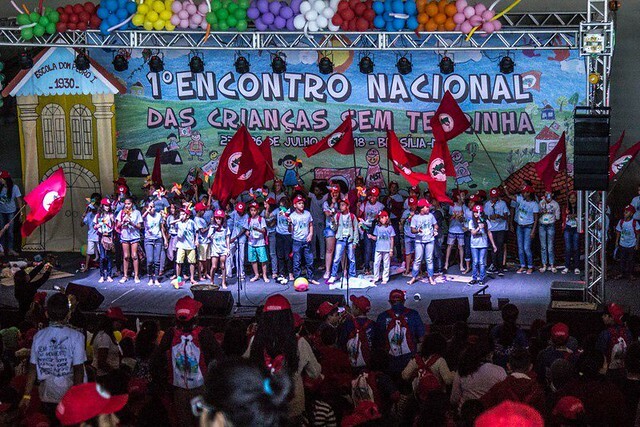 Restating children’s willingness to struggle and build the project for a People’s Agrarian Reform, 1,200 children coming from several different camps and settlements across Brazil released the Landless Kids’ Manifesto during their National Meeting held in Brasília, Brazil, which will take place until July 26th. “We wrote this Landless Kids’ Manifesto so that, together with other children, we can fight for our rights and grow in a world with no social inequality, where we can be happy,” says the manifesto presented by landless kids this Tuesday (24). Gathering landless children coordinators from all states who are taking part in the Meeting, the kids reiterated their struggle for healthy eating and children’s rights, and against all kinds of discrimination and disrespect to people. Who are you, then? Landless Kids once again! What’s in store? Victory and nothing more! Will this wave catch on? The wave has caught on! To say it out loud: Landless Kids are around! We, Landless Kids, are holding our 1st National Meeting in Brasília, from July 23rd to 26th, 2018. We are very happy!!! The Meeting is a space for us to get to know a lot of Landless kids and children of other rural and urban people’s movements from Brazil and other countries. We’ve learned about the history of children’s struggle in Palestine, Syria, Haiti, Cuba, and Venezuela. We want all children in Brazil and the world to be happy and free, so they can fly kites, play soccer, sing and dance in circle, and study. We wrote this Landless Kids’ Manifesto so, together with other children, we can fight for our rights and grow in a world with no social inequality, where we can be happy.